I am hard at work on further books in the Captain Jane Thorn series. Which actor(s) and/or actress(s) would you like to see playing the roles of your main characters if your work was adapted for the big screen? 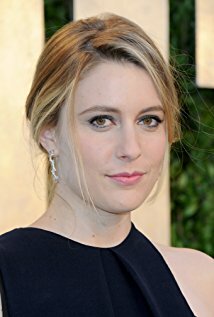 Among the actors working today, I think Greta Gerwig could definitely fill Jane’s boots. Research is everything! I want to bring the reader into Jane's world and make it feel familiar. The problems people were solving in Jane's day laid the foundation for the world we live in today. Have you ever thought about how long it would actually take to raise the anchor on a 200 ton ship? Longer than you might imagine! ​When did you decide to become a writer? I am not sure it was something I decided! I love stories, and storytelling, and I had the idea for my protagonist floating around in my head for a long time. Eventually, that coalesced into the first scene of the book, which I could see so clearly. I decided to write that down, and it took off from there! Writing is fun! It is everything I love about reading, but I also get to decide what happens with my characters. And I get to tell as many stories about them as I want -- no waiting for the next book from the author! I write when the mood strikes. Thankfully, it strikes more often when I have a deadline to meet. When I have a writing deadline, I tend to write every day. But since I am not on a schedule, I don’t stress about it if I skip a day or two. I write to deadline, so whatever it takes! No daily word counts or anything, I just write until I am done, making sure to meet my delivery date. Straight into Google Docs, each chapter its own document. Then I combine them into a single document in Word format to send to the editor. Well, I have a pretty good idea of the major plotline, but my characters pretty much do what they want to do. They are constantly surprising me! I know that sounds crazy, but it's true. In general, I know what the central storyline will be, but how things play out is always a mystery until it happens. I find myself saying, "Oh really?!" a lot when I am writing. In general, I expect that it will take a couple of hours to write a chapter, although sometimes it goes much more quickly. So perhaps 50-60 hours for 75,000 words on average. That’s just a first rough draft, of course! Captain Jane Thorn is born into a trading family in Newburgh, New York in 1796. She grows up on her family’s sloops and becomes a captain in her own right in her late teens. Each book of the series revolves around a voyage that she takes aboard her schooner, the Destiny, with her loyal crew. What are your thoughts on writing a series vs stand alone novels? I have always loved reading series fiction, so that is a natural path for me to follow. I love getting to know characters and a world, and not have it all come to an end at the last chapter. It is wonderful to know that I can spend more time with the characters in the next book, so it is natural for me to think that way as a writer too. I read all the time, and tend to pick up non-fiction books most often. Science, sociology, history, memoirs -- I love it all! I have developed a pretty significant book mold allergy, so ebooks are a godsend. Proofreading and editing are a collaborative effort with the publisher. I find it an extremely valuable phase of a book project -- the editor is standing in for my future readers, and if something bothers her, it’s going to bother them. So I have to smooth out those stumbling blocks one way or another. Do you let the book rest – leave it for a month and then come back to it to edit? Since I am writing to a publishing deadline, and there are multiple books in the works at any given time, I switch back and forth between manuscripts I am writing and ones I am editing. But each individual book is always moving towards completion. Paperback, ebook, and Kindle Unlimited. I hope to create audiobooks later this year, which will be a new experience for me. The book cover was designed by the publisher. They gave me a couple of mock-ups to react to, and one seemed more in tune with the zeitgeist of the story. From my point of view, there is a broad range of what would be acceptable in a cover. So as long as I don’t have a major concern about something, I am happy to let the publisher decide. For me as a book buyer, the cover is the thing that tells me if it’s the sort of story I want to read. It’s everything! With so many books competing for the reader’s attention, the cover has to communicate massive amounts of information in one glance. Glad it’s not my job to design that! How are/did you publish this book and why? e.g. Indie, traditional or both? This series is under contract with SisterShip Press Pty Ltd. They are a small press in Australia that also produces SisterShip Magazine. I had finished the first book in the series and done a self-published “soft” release on Amazon Kindle Direct, but had not put any marketing effort into it as I wanted to finish the next two books before I started trying to find readers. I saw SisterShip’s call for manuscripts and thought my book might be a good match for their expertise and interest area. What is your opinion on the age-old ‘which is better?’ self-publishing vs traditionally publishing question? Pros & Cons? These various channels don’t actually cancel each other out! As an author, you might choose to have books published in many different ways. The only thing I would say is that you should commit fully to whatever you choose if you want to find an audience and sell your books. For me, right now, that means that I need to provide my publisher with the best manuscript I can write, collaborate fully with the edit process, respond quickly to any requests they make as part of the publication and marketing processes, and be proactive on my own end with marketing and outreach. At the time I responded to the publisher’s call for manuscripts, I was still in “writing” mode, and knew it would be at least another year before I could take on the major effort involved in book marketing. Involving a publisher in the process would mean that I would, first of all, have an editor work through the book with me, which I knew would make it a better book. And secondly, the book would start to find a market sooner, which would mean I might be able to keep writing more books! Once the book was published, I began devoting at least an hour or so a day to marketing activities. My publisher provides me with lists of things to do, and I work through them as quickly as I can. The biggest part of my marketing input is creating and maintaining my social media content. I do something there every day. As a reader, I find reviews extremely helpful, good or bad. As an author, they are valuable input. If a bunch of readers hated the book, that would tell me something important! But in general, you need to look at an “average” review and ignore the disgruntled outliers. It seems like the internet is a primary channel for locating, purchasing, and reading books, so social media has got to be a large part of that. Even if you intend to sell most of your books through stores or other venues, you need to have a strong online presence. Hooboy, I am a newbie at all of this, so not sure how relevant my comments are! Certainly, as a reader, I am willing to try something new if it is available for free, such as Kindle Unlimited books. So yes, I think free is a powerful piece of the overall marketing strategy, and another good reason for working either in the series format, or in the same general genre. It allows you to have a “loss leader” that new readers can find, but then have something that brings in revenue targeted to those same customers. I am sure it would come as no surprise to say that I read. All the time. Know thyself. Learn who you are, what you like, what works for your personality. Then do that. It would be fun to have lunch with Louisa May Alcott. She grew up in an interesting time and place in a challenging family that lived well outside the prevailing norms. She always struck me as a fascinating thinker as expressed in her books. As in so many things, the lines are continuing to blur. Books are no longer things unto themselves, but are part of a “universe” that might include a movie, but also a game, website (Pottermore, anyone? ), action figures, fan fiction, Youtube content, and so on. I see things continuing in that direction. Pamela, Thank you so much for taking the time out of your busy schedule to chat with us about your debut novel! It certainly is turning out to be one heck of a story! We wish you the best! It is 1820 and a young, female sea captain sets sail aboard the schooner Destiny bound for the sugar plantations of Cuba and then on to the Baltic for iron. Political intrigue and mystery dog the voyage, and those who underestimate the captain's skill and business acumen do so at their peril. This is historical, nautical fiction with a fresh new take. 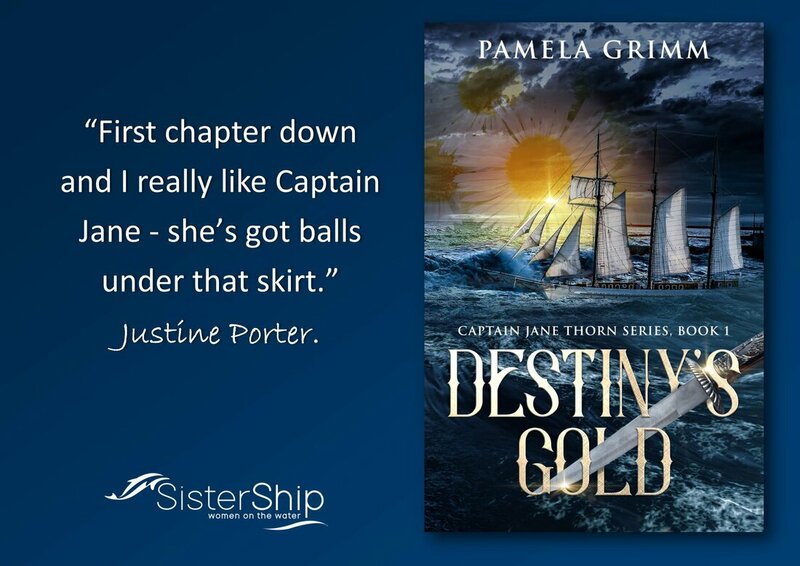 Destiny’s Gold author Pamela Grimm has created an indomitable female character and a story line that keeps you guessing. Pamela combines her love of maritime history with experience as a commercial and recreational captain to bring to life the golden age of merchant sailing ships in the person of Captain Jane Thorn and her loyal crew. Have a question or want to leave Pamela a comment? ​Please feel free to using the area below.